I’ve just spent a classic Sydney weekend out on Sydney Harbour, two days with clear skies and a classic NorEaster to boot. 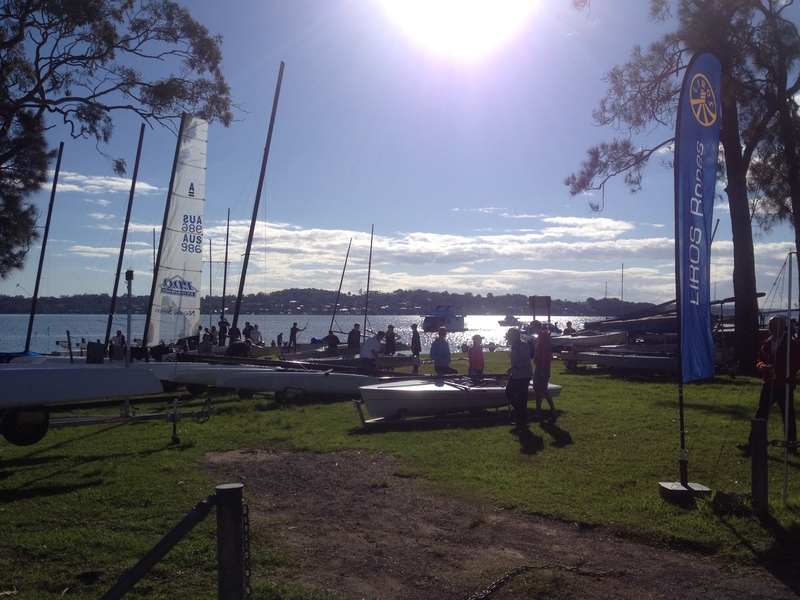 Two days and four races run each day for the Australian Farr40 fleet in Sydney. Whilst it was a small fleet, they were as competitive as ever, one mistake/ bad tack or gybe and you lost fleet position. Former Farr40 World Champion Team Transfusion were the most consistent across the eight races with Kindergarten and Exile taking up the minor placings. With five different heat winners across the eight races, nothing was certain till the finish and there were some close finishes too. The gate roundings were also keenly contested and I witnessed a few luffing matches downhill. I hope that the photos give some idea of how close the racing was. The start sequence with Transfusion and Kindergarten hitting the line at speed and then taking alternate gates at the bottom. 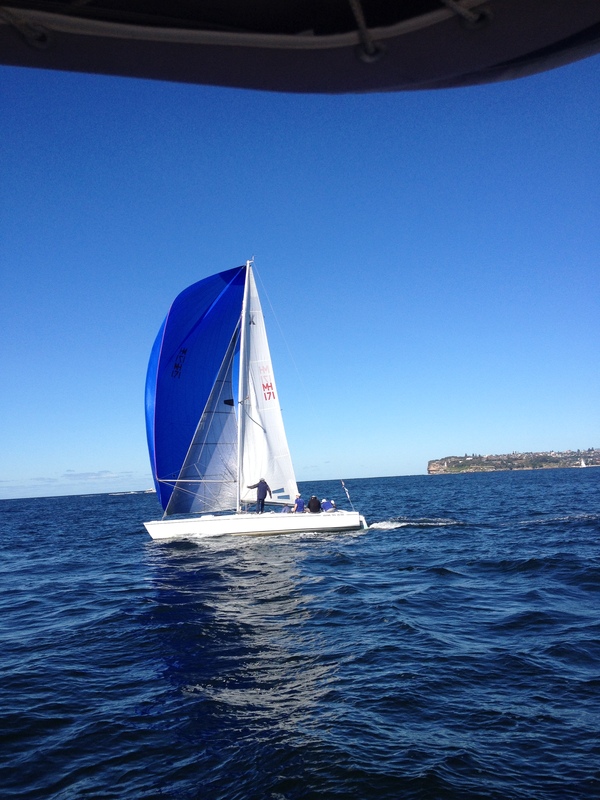 The last photo was taken showing downwind from the startboat at anchor and just what great conditions we had. I’m off to Perth next weekend to do the rounds showing off some more of the new DeckHardware range. Then it’s another weekend of closely watching the Farr40s again on the harbour. Hopefully it’s another great weekend weather wise too! I have just spent an enjoyable couple of days at Toronto with the NSW Sabot State titles. With just on 50 competitors, some just starting out, it was great to see these young sailors out on the water. The breeze co-operated too with pleasant southerlies on both days of around 10-12 knots, perfect conditions for the younger ones. The village of Toronto was also holding its annual fair so there was plenty of buzz around, with rides and food stalls as well to keep everyone entertained on the Saturday. The sailing started out with a ‘Dash for Cash’ event up the foreshore showcasing the class and the enthusiasm of the junior sailors. Plenty jumped the gun, as I couldn’t see the other end of the line at the start! All in fun though and having some fun is what it’s about out on the water. With two races each day, a triangle followed by a windward return, Jed Fatches from nearby Wangi lead the leader board with 2,2,1,and 1. We’ve been following Jeds sailing for a couple of years now and we look forward to seeing more of this young sailor. I’m sure there’ll be plenty more to catch our eye as well in the following rounds. The support from the association and the members of Toronto Amateur Sailing Club was fantastic and I commend them on the success of the event. This time last week I was finishing up a week of seeing everyone in Southern Queensland. The previous trip at the end of May had a few issues and therefore the trip was a few days shorter, hence a return was required. I left home on Sunday morning and first stop was the Nabiac Caravan Camping & Boat Show. Just about the middle of the NSW coast but it was a reasonable sized event, certainly plenty of locals. There were plenty of vans with a scattering of everything else around the town exhibition grounds. Monday Morning after a night in Coffs, it was Yamba seeing a few DeckHardware customers there, then Ballina followed by a drive up to the Sunshine Coast. When will the road works be finished on the north coast of NSW? Who knows, but it’ll be great when it is, especially the Ballina north section. It’s pretty peace meal at the moment starting at Nambucca Heads. 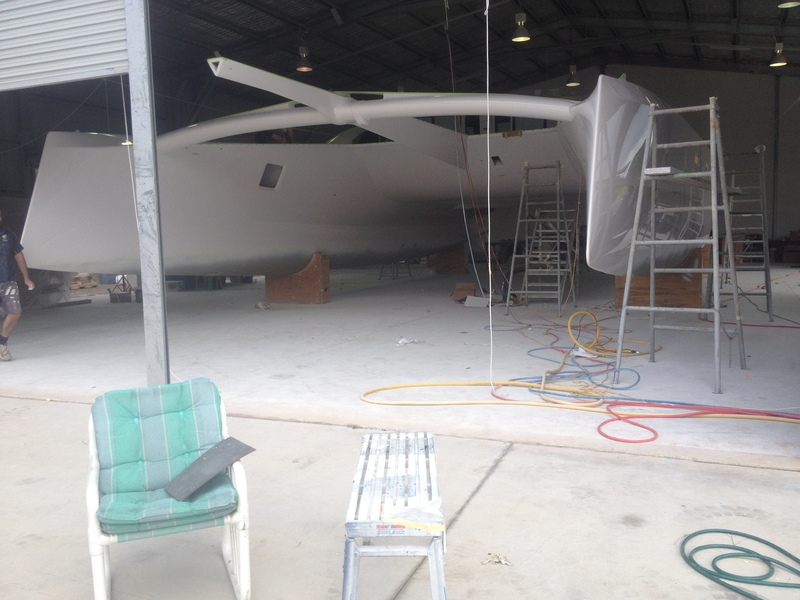 I spent a couple of days on the Sunshine Coast seeing everyone and looking at various boats under construction, it’s good to see Aussie boat builders working on new boats. The Schionning Catamaran shown is fitted with Forespar Marelon plumbing. Wednesday and Thursday morning around Brisbane, again showing a range of DeckHardware products. Now that we are distributing all of the Schaefer Marine range, I have to make sure all the riggers and sailmakers are aware of the Tuff Luff range. Thursday afternoon and in to Friday, it was down to the Gold Coast with more of the same, doing the rounds and making sure all of the outlets are fully aware of what products DeckHardware has to offer. It’s especially good to have some place orders as well, both for stock in the van as well as from the warehouse. After nearly a week of non stop drizzle, it was good to head south again. Saturday was the start of the Sydney Gold Coast Race and whilst not involved this year, I took out the MHYC startboat with a couple of others to watch the event. Once again it was a drift out the heads. All except for the 100’er Perpetual Loyal. They got a westerly gust at South Head and just took off, those only boat lengths behind could only watch and listen to the groans as the carbon super maxi took off. Everyone else had breeze from all points, Hero to Zero in these conditions, some doing well and others not so. For those looking up Loyals mast, yes that’s a crew member. His role in not only finding the wind, was to kick the main sail battens across in each gybe, so light were the conditions. On one gybe it too 6 attempts to pop them. Next up is my long drive down to Port Lincoln in South Australia. From there, I’ll work back anti -clockwise around the coast in to Melbourne. This trip takes two weeks, plenty of road time but plenty to see. Those that follow my movements will know that recently I was away in Southern Queensland. Every thing was planned and going well, I filled up with fuel just off the Gateway Motorway in Brisbane on the Sunday afternoon following a nice drive up from Sydney. As I waited to turn right back on to the motorway, no gears. Bugger! 1400 on a Sunday afternoon too. So I called for a tow truck and also let Robyn know what had happened. I was able to get the van to a VW dealer and lock it up in order to return first thing Monday morning. Next call was to an old mate who has helped out now and again with DeckHardware – Mark Grey. Mark’s moved up from Surfers to Brisbane in order to be closer to his business building campers and trailers. I was able to stay with Mark whilst the van was off the road for two days. As it turned out, the drive shaft had worn and needed replacement, so two days were lost doing the rounds. I did however spend some time helping out at Aussie Campers & Trailers, always something new to learn, in this case servicing wheel bearings. Thanks again to Mark and Jules for the hospitality. To add to the bad day, I also found out that Ben Nossiter had just passed away. Ben has been an Adams10 sailor for many decades and no one at Middle Harbour Yacht Club has come near his record of 18 club championships. I had visited him the previous Thursday in Hospital and we agreed to have a rum at the club upon my return. Unfortunately this was not to be and Ben will be missed greatly. Following discussions with Robyn, it was decided that I return for the funeral, therefore cutting the trip short. With all of these issues, another trip is planned back in a few weeks time to see those I missed out on. I did however get to see a few customers and whilst at Scarborough, I came across a yacht I thought I’d never see again. This particular yacht was owned by Robyn’s father John Dibble when we first started dating and was sold after our wedding to step up to a Farr 1104. Defiance is the original IOR MK3 S&S Half Tonner, built by Doug Brooker and was the plug for the mould that Savages in Williamstown ended up making how many versions of. 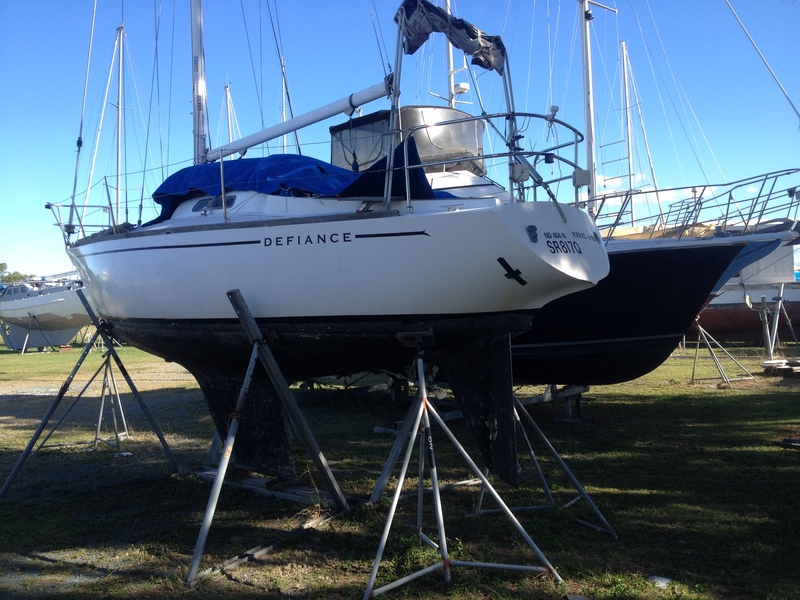 Many adventures were had aboard Defiance, MHYC Club racing, Offshore’s, Two Handers, RSYS cruises to Lake Macquarie. Broke the boom on one cruise and as the ladies race was the following day, a replacement had to be made ASAP, Done. Plenty of memories. I hope that the current owner will look after her and have as much fun as we did. For something different, last Saturday I took the DeckHardware van up to Wangi. At this time of year they have a regatta for a variety of classes and once again I was able to help keep the sailors out on the water. 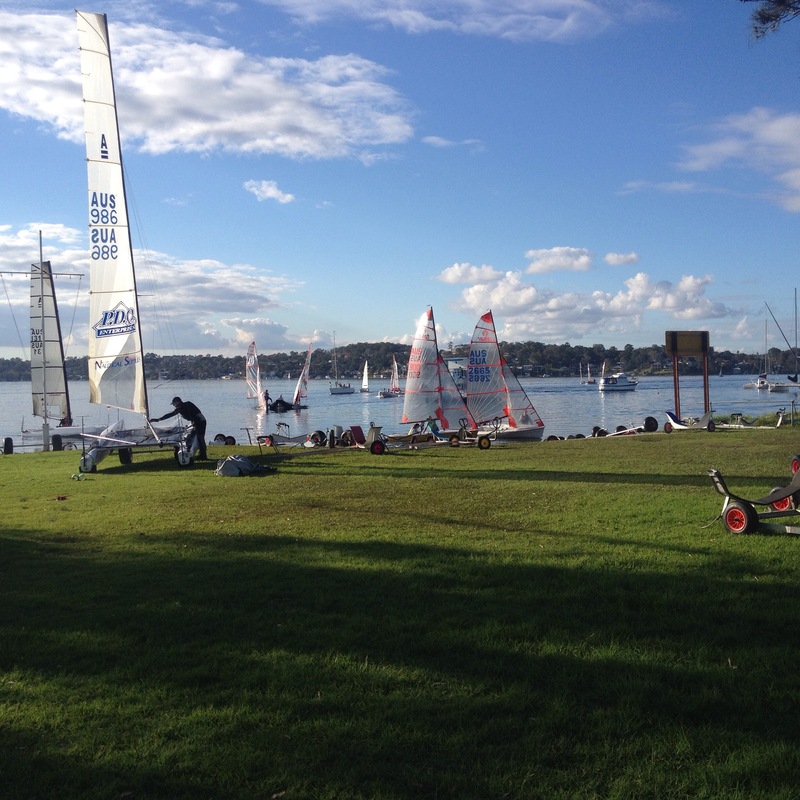 Wangi is the home of many top sailors and with the expanses of Lake Macquarie, it’s pretty easy to see why many overseas teams like Oracle come to train there. And it’s close enough for a day trip. It was a great Winters day, however the conditions weren’t too nice on the Race Committee and the sailors, as most got a tow home due to lack of any breeze. One of the rare occasions, I’m glad not to be out there, frustrating to say the least. A weekend on the water, for a change. This last weekend, before I’m heading north, I spent once again out on MHYCs start boat running a few races. 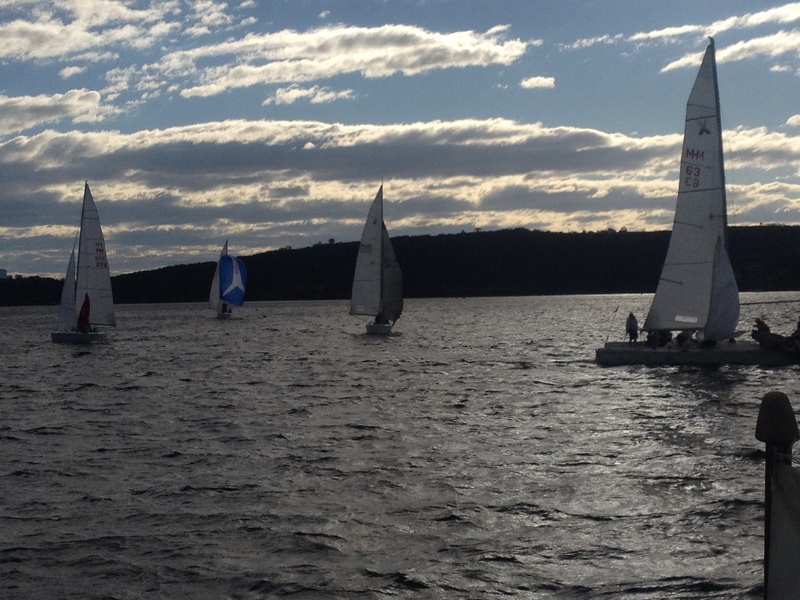 Saturday was race two of the Winter series and the weather was just nice for the small but competitive fleet. We had a nice WSW breeze of about 15 knots maximum. 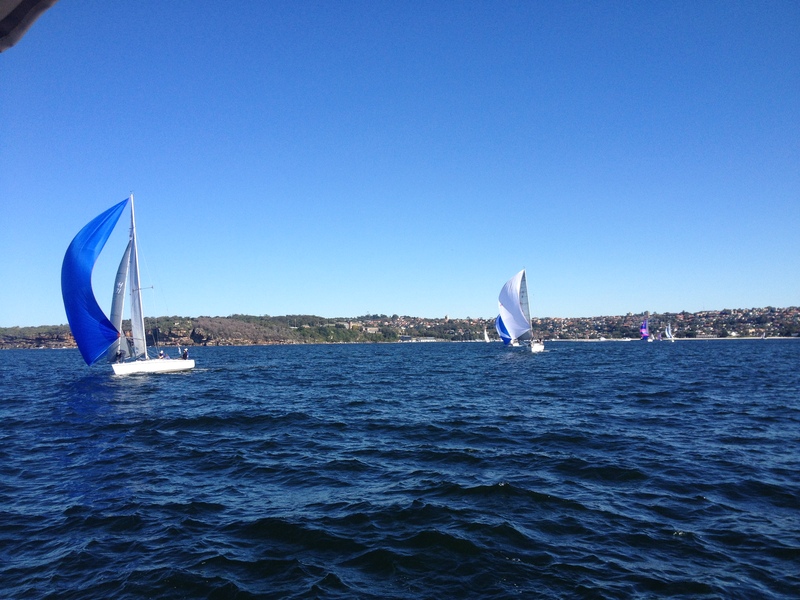 All the boats managed to sail the whole course without shortening, as is the case some weeks when the breeze drops off, but that’s winter in Sydney with the prevailing Westerlies. Nothing too exciting apart from the dolphins herding fish in to Balmoral where we were anchored for the finish, too far away for any photos. Saturday night was the annual Summer season prize giving where all the divisions, Saturdays, Wednesday afternoons and Thursday night fleets are acknowledged and trophies are handed out to those who excelled. Always a good night where everyone catches up. Unfortunately, Ben Nossiter who has regularly featured on the wall for the Adams10s for over 20 years wasn’t able to attend due to ill health and everyone wished him all the best. Jim Nixon, his long time mainsheet hand accepted and spoke on behalf of the crew. Sunday and back out on the water for the Annual Waitangi Cup. This is a teams event the Adams10s hold between New South Wales and Victoria, unfortunately this year the Victorians could only field two crews, so it was 2 on 2. Easy for race management and scoring purposes! Again with the Westerly slowly shifting right all day and gusting from 9-20knots, all four boats had to be on the game with headsail choices varying between #2 and #3s. NSW however in the first two races finished with a 1, 2, so the third race was a bit of a dead rubber. It’s always interesting this event, as to make it a little more even, there is a boat draw the day before. No one is allowed to sail their own boat and there’s always plenty who can’t find the halyard or control line where they are used to it. NSW retained the Cup, 11 points to 19. Bring on next year, the Victorians are planning on taking to Cup back, they’ll be holding it down at Blairgowrie on the same waters as the recent Moth Worlds. Shallow water and tidal conditions will make it interesting. Next weekend I’m on the road north for a couple of weeks in the DeckHardware van ‘doing the rounds’. 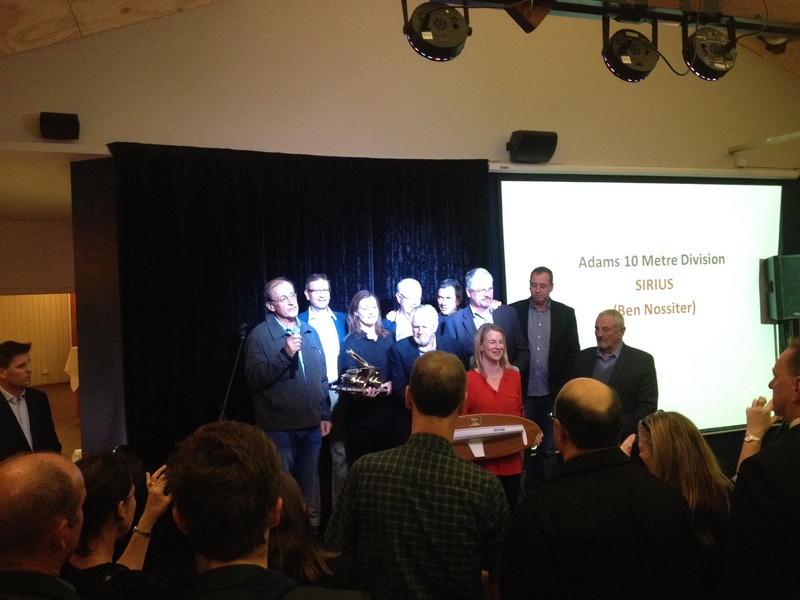 I’ve been involved in the Adams10s for over three decades now, as crew, as owner with Melissa and as the Principal Race officer at Middle Harbour Yacht Club. The class is one that’s close to my heart, having sailed on 12 of them over the years. You can sail short handed, do No Extras like Wednesday and Thursdays or race fully crewed on weekends and in various regattas. They are an all round boat. Those that sail them agree. 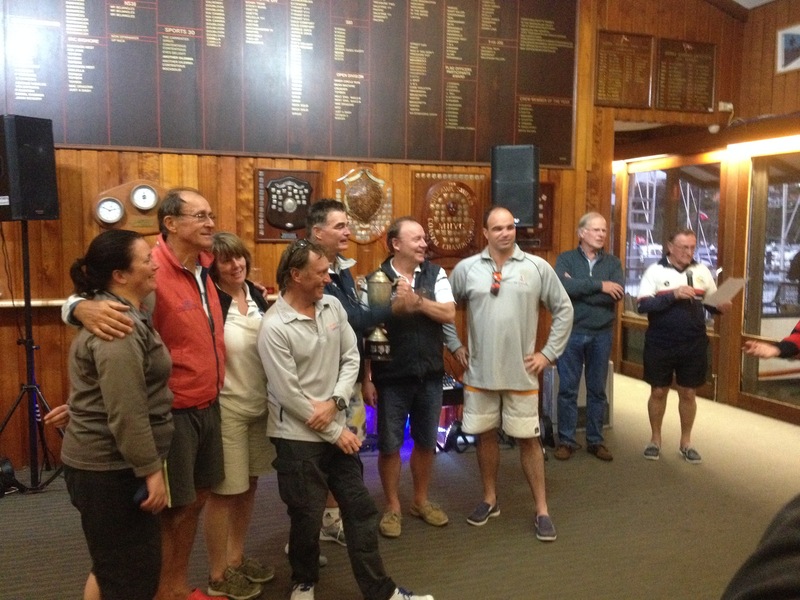 This past Australia Day weekend saw the class back at MHYC for their annual championships. Unfortunately there were no outsiders, either from Lake Macquarie, Pittwater, up the harbour or interstate. The clubs fleet of ten competitive boats had 7 races to battle it out again. 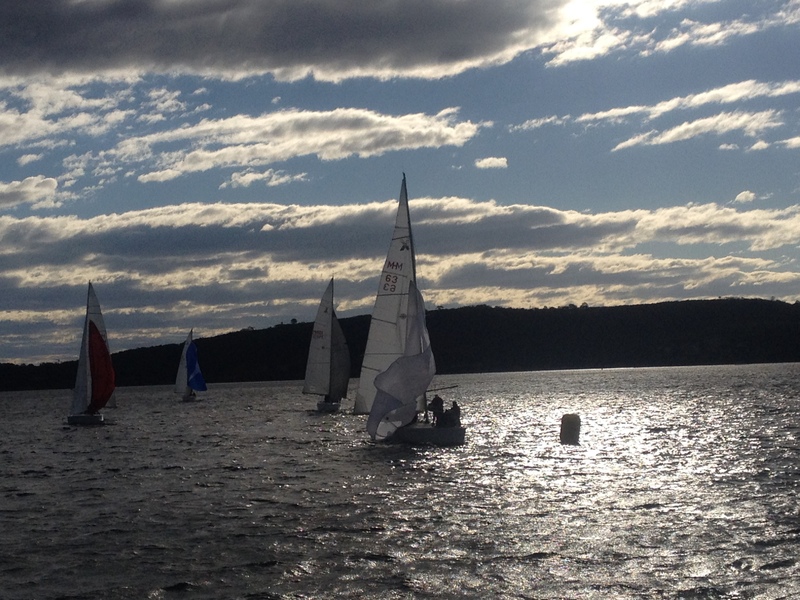 Saturday saw a lovely Noreaster up to 18knots, so I managed to get in 4 races for them. Sundays forecast was for light and variable and that’s what we had. I held them ashore for a while and just as we set the course the breeze changed 40 degrees – typical. So we only had the time to get one race away. 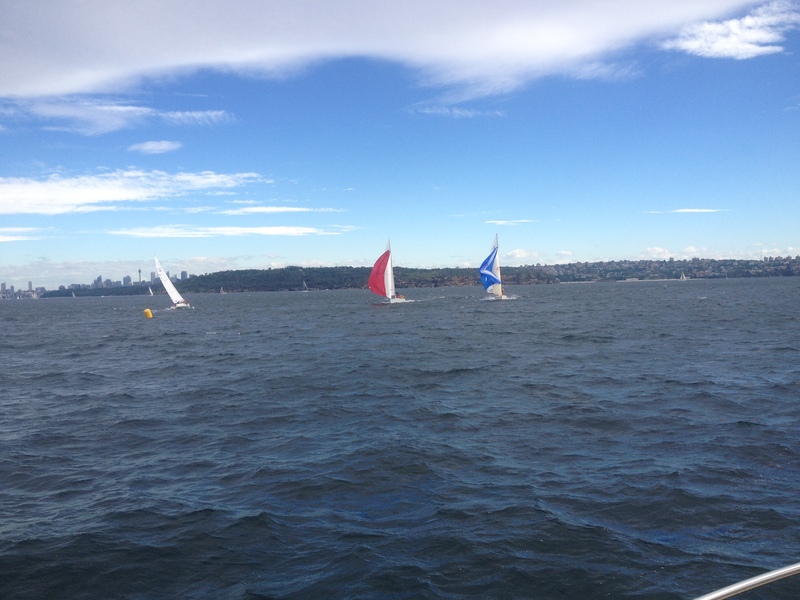 Monday brought Southerly winds and a little drizzle for the final two races. As it was Australia Day there was also the added bonus of having to avoid the other fleets racing. The finish of the first race saw the first four boats all overlapped and the start team all thought, ‘What are we in for?’. As it turned out that was the closest finish for first place. Other races saw individual duals with several competitors asking, ‘Who beat who?’. Pre regatta favourite Another Dilemma sailed a very good event, winning four races, adding a second and a third to the score. Helmsman Tim Gallego, who flies in each year from his new base in England had only one indiscretion – a Black Flag Disqualification in race three. But he was one of three BFD! Second in the event was Rob Clarke on Kick and Chase, Rob’s a newcomer to the class, having owned several types of yachts at Middle Harbour over the years. He was ecstatic of course with the end result, going in to the event trimmer Shane Guanaria said they would be happy with third or fourth. Class stalwart Ben Nossiter has suffered a few health issues lately and wasn’t as competitive as he has been in the past. Ben and his crew were however happy to have finished third. As usual, it’s a team effort when running an event, having the assistance of Toby Gurzanscky on the clock and Lindsay Rose laying the marks, made it look good. Those from the various boats who made up the rest of the volunteers to assist, also enjoyed their time on the start boat or mark laying boat. For some it was their first time to see how it was done. Some should make the effort more often going by some of the questions they asked, as they were a little surprised as to the amount of work required to run an event. They are of course more than welcome each Saturday. It was also good to see Matt Carroll, the new CEO of Yachting Australia. Melissa and I sailed for many years with his father Patrick on his Adams10s, The Carpenter. Matt was invited to make the presentations, great to catch up with both he and his brother Terry back at Middle Harbour. Next up for me is a trip to Tasmania next week. Aside from packing the DeckHardware van full of stock for the visits to the various outlets, I’m also going to spend a little time around the Australian Wooden Boat Festival in Hobart. This is a Bi-Annual event that brings the Marine Industry together with those who love the feel, texture and smell of the old days. Shaved wood for example, a smell I can’t forget from my youth helping my father build the various boats – his and mine There will be a range of boats on display as well as distributors and retail outlets. I’ll be there with my old mate, Ben King and Brierley Marine. Ben has helped out DeckHardware over the years and this time it’s my turn. 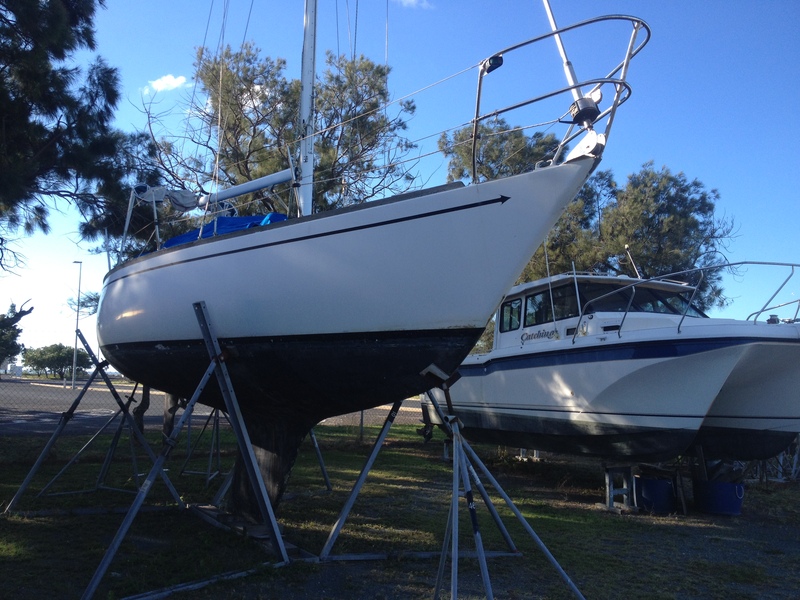 He will however be back to assist us with the Sydney Sailboat Expo in a couple of months time though, more catching up.